As privatized platforms like Academia.edu look to monetize scholarly writing even further, researchers, scientists and academics across the globe must now consider alternatives to proprietary companies that aim to profit from our writing and offer little transparency as to how our work will be used in the future. 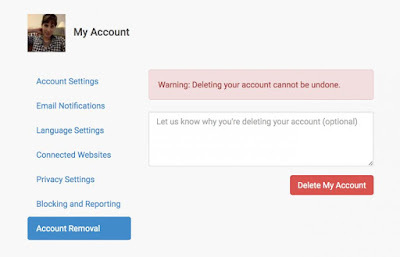 In other words: It is time to delete your Academia.edu account. 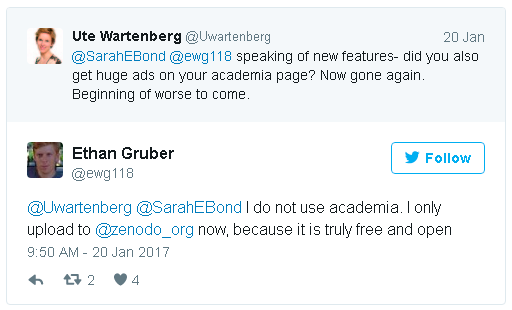 At first glance, Academia.edu looks like a win-win situation. The platform allows users to create a profile, upload their work, tag certain interests and then to tap into large networks of people with like research interests among the almost 47 million users from around the globe. But looks--and names--aren't always what they seem. First and foremost? That web address is more than a little deceptive. As Kathleen Fitzpatrick, Associate Executive Director and Director of Scholarly Communication at the Modern Language Association (MLA) remarked on her blog, "the first thing to note is that, despite its misleading top level domain (which was registered by a subsidiary prior to the 2001 restrictions), Academia.edu is not an educationally-affiliated organization, but a dot-com, which has raised millions in multiple rounds of venture capital funding." 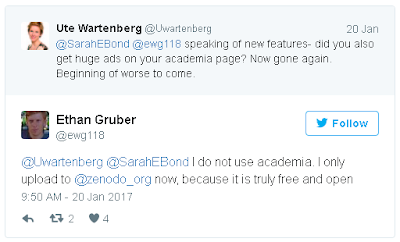 Historian Seth Denbo probably said it best when, almost a year and a half ago, he warned scholars that they were providing free data to a for-profit company rather than participating in an open-source, non-profit often associated with .edu domains. Last year at this time, the site received a hefty amount of criticism due to its emailed queries to scholars asking if they might want to pay a "small fee" in exchange for getting papers "recommended" on the site. In other words, they were offering to signal boost publications in exchange for money. This was met with quite a bit of backlash from users and some especially bad PR, which essentially seemed to kill the initiative. However, the site remained committed to figuring out how to get more money from users by introducing the "premium feature" in late December. This feature allows users to get special data analytics about who is reading their papers, including the "role" (i.e. the rank) of the person looking at their work. Emails even go out to users letting know the percentile (a top 4% scholar!) of the person downloading their work. Are we supposed to somehow value that a full professor looked at our work over, say, an adjunct? The new feature is academic class politics to a new level--and it only promotes the further stratification of the academy. allows you to see the status of the person looking at your work. What, then, are the alternatives for people who want to freely distribute their work? It turns out there are a number of choices for people both connected to a university and outside of them. Institutional Repositories: Many universities and colleges in fact have their own institutional repositories for research. At the University of Iowa, we have Iowa Research Online, which grants space to undergraduates, graduate students, faculty and many other researchers to house their work. There is in fact a consortium of repositories from the Big Ten schools called the Big Ten Academic Alliance that then begin to connect networks of scholars in a searchable database--although it is admittedly a much smaller network than exists at Academia.edu. Zenodo: Another repository for research data is called Zenodo. It is funded by the OpenAIRE Consortium (an open access network) and CERN, the European Organization for Nuclear Research. The site is a non-profit and integrates easily with your GitHub account. It allows users 50 GB of storage for each dataset, though you can contact them and lobby for more. 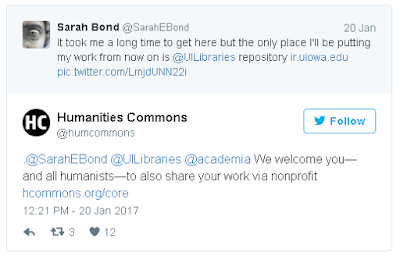 Humanities Commons: Humanities Commons is a non-profit network open to all scholars to post their work and access the scholarship of others. As they say on their site, it "is a project of the office of scholarly communication at the Modern Language Association [MLA]. Its development was generously funded by a grant from the Andrew W. Mellon Foundation." They work with the institutional repositories to help preserve scholarship online and keep it both protected and free. Many of the open access platforms that do not seek to monetize scholarship are in fact funded by government foundations like the National Endowment for the Humanities (NEH) and National Endowment for the Arts (NEA), in addition to those privately funded by the non-profit Andrew W. Mellon Foundation. Humanities foundations are thus even more imperative to scholars who wish to share their work freely without fear of having their scholarship used for profit. It is also one reason that last week, the news that the NEH and NEA may be cut due to budget restrictions caused so much worry. 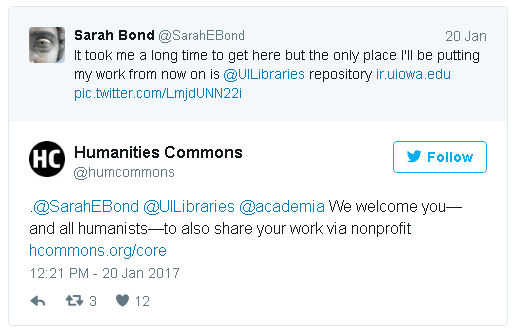 Humanities scholars rely on these entities not only to fund our work, but often also to preserve open access to it in the future. In the interest of full disclosure, I must say that I too have benefited greatly from funding from both the NEH and the Andrew W. Mellon foundation in my own research. As Eric Kansa, founder of the non-profit Open Context and an advocate for open access platforms told me about data privacy, "One's research interests and interaction with scholarship (and networks of other scholars) get monetized by Academia.edu. It's troubling, because those data can be given to the state. Giving up privacy for access is not a form of 'open access' I can endorse." Moving our papers away from Academia.edu is then about taking possession of our work and deciding what we do with it, rather than allowing a private company to use our scholarship for profit.